Forty-one percent of registered voters believe the tax reform bill signed into law in December will help them and their family financially, according to a Marist survey of 1,350 adults. Favorability for the plan has increased since December of last year when only 30 percent of adults believed the plan would help them financially. Recent media reports have shown that many companies are giving employees bonuses, raises, offering more benefits, and expanding their businesses due to tax reform. Apple Inc. has announced it is giving employees a bonus of $2,500 in restricted stock units. 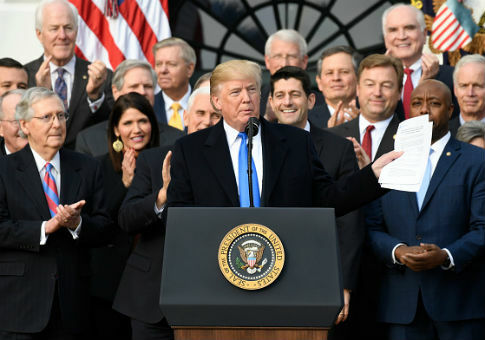 "In the weeks since President Trump signed the Tax Cuts and Jobs Act into law, hundreds of businesses across the country have rewarded their employees with bonuses, pay raises, and other financial benefits," a statement from Speaker Paul Ryan (R., Wis.) reads. "Come February, 90 percent of Americans will see bigger paychecks as the IRS adjusts withholding tables to account for the new law." Thirty-nine percent of registered voters believe the tax plan will hurt them financially. Eleven percent were unsure. Registered voters were also more likely to believe the plan will help businesses (63 percent) than working people (23 percent). Among registered voters, 21 percent believe Trump has had the most impact on taxes in his first year in office. Twenty-one percent say the economy has seen the most impact. Nearly half of American voters—48 percent—believe the economy has gotten better in the first year of Trump's presidency. Only 17 percent believe it has gotten worse.